Stumbled upon this Etsy seller when I was just checking out the latest Showcase last week. Her name is Merissa Cherie Hi'ilani Revestir from Hawaii and a proud owner of loveMER. She is the eldest of 5 children (big family like mine!). She is married and has a plant named Curtis (how cute!) She got to know about Etsy from her sister who also have a shop on Etsy. What caught my eye about her items s is that she uses the chain to create words which is really different and creative! I love the way she uses the different colors of paper as the background which makes her items really pretty & sweet. 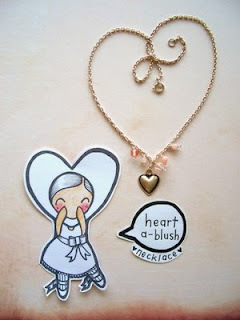 Here's one of my favorite, HEART a-blush necklace. Such a sweet name.. Perfect for the coming Valentine's Day. I´ve checked her shop...so cute and beautiful! That's a really sweet necklace. I'll have to check out her shop!! Dear Alice & your lovely blog guests: I am so overwhelmed by your sweet comments and visits to my little Etsy shop:loveMER! It means a lot to me and I will make more jewelry and take more photos in hopes to put more smiles on your faces...and hopefully have more ♥'s!